We take great pride in the quality of property management and associated services that we deliver to our clients. If you currently employ another managing agent, but would like to make a change please contact us to find out how our services will improve your building or estate. We will start working with clients and their existing agents well before the handover date to ensure that any change is as smooth as possible. We work strictly to ARMA guidelines and will ensure that we are ready to hit the ground running from the first day. We are fully compliant with all RICS service charge codes, and as members of ARMA are fully signed up to ARMA-Q. If you would like to find out how our services could improve your building or estate, you can request a proposal from us here. Atlantis will save you money by providing better management, value for money and a long-term plan for your development. We have invested in new systems and technologies, ensuring that the services we offer are of the highest standards in the property management business. Further we have an extensive procurement system, where we can offer you the market’s most competitive prices when purchasing insurance, organising communal utility supplies and great value buildings insurance policies. Above all though, we are accessible to all customers whichever way they want to communicate with us and each client will have a company director as a key point of contact. Atlantis believes that each development should have its own individual manager who will know the block or estate intimately. Communication is essential and all our Estate Managers will meet with clients regularly and arrange formal meetings with the owners. Further and where required our Estate Managers will also meet residents individually to discuss any specific issues or concerns. We are experienced in the employment and management of on-site personnel such as caretakers, concierge staff and porters. Our unique employment service minimises risk and maximises the potential of the individuals servicing your development. 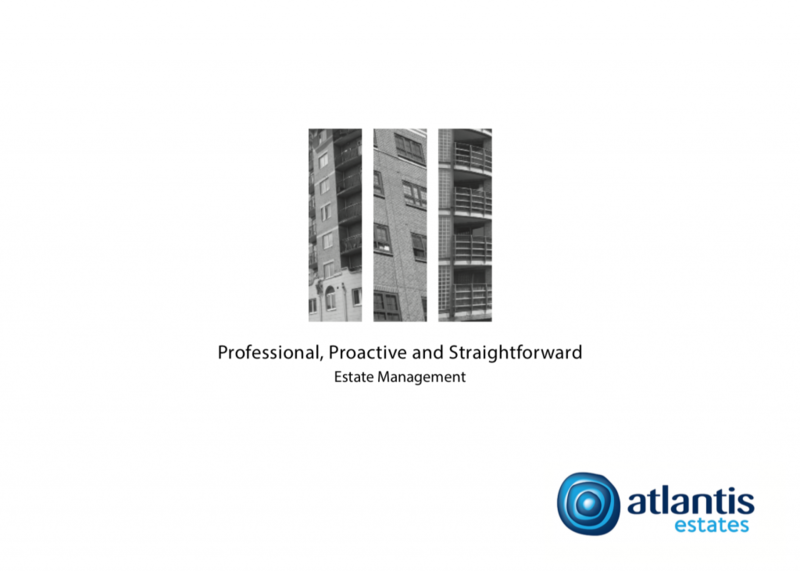 One of the most important factors in estate management is actually getting the job done, completed to a high standard, undertaken swiftly and without delay and all at a reasonable price. We have great experience and a great panel of contractors on hand to assist with this, whether it is an emergency which requires swift action, or a major refurbishment to the common areas which will require intricate planning and management. The estate manager will carry out regular site visits and will produce a site inspection report customised to each development. These checks are thorough and cover all aspects of the development, from checking light fittings to inspecting the quality of the gardening to slipped or missing roof tiles. We will arrange and manage all contracts covering gardening, cleaning and all other day to day requirements for the development, negotiating competitive rates whilst ensuring the best service is provided. In the event that you have preferred contractors we will of course continue to use their services as instructed. For larger maintenance projects we will arrange at least three estimates and comply fully with requirements under Section 20 of the Landlord and Tenant Act. In addition we will supervise these works and ensure that a professional finish is achieved by the chosen contractor. We believe that preventative maintenance is always the answer both economically and practically and will provide the necessary advice to our clients to ensure that this is always the first option where possible. We will advise and ensure that your development or estate is compliant with the latest regulatory health, safety and fire legislation. Health and Safety is a priority for all Estate Managers and is embedded in our culture, so you can rest assured that we take the safety of residents in our developments as one of the highest priorities. Careful financial management of your estate is crucial to ensure that all repairs, insurances, planned improvements and major works can be funded and carried out. Our trained accounts team work tirelessly to ensure that both the Estate Manager and the client have access to such information which will be accurate and clear. We will supply financial reports on a regular basis which will enable you to monitor the financial performance of your development. In addition the accounts team will ensure that service charge, ground rent and insurance demands are sent promptly to all owners and ensure that proactive credit control procedures are in place to avoid any cash flow problems throughout the year. We are able to offer various payment methods including monthly instalments and credit / debit card payments, thus ensuring residents have every opportunity to settle their accounts. Through careful liaison with the client we will establish and maintain an appropriate reserve fund for all developments. Presence of a reserve fund now has a positive impact on the value of the individual units as well as providing a buffer for any major or planned repairs that come about. Each development will have separate client bank accounts and we are regularly audited by RICS. Atlantis has developed Pathway, a website for each development which enables clients to access their development account. Here online service charge payments can be made and important information such as buildings insurance certificates, budgets, newsletters and other vital information are available. Issues can be logged and tracked via Pathway 24 hours a day, 7 days a week. We have a wide and varied range of insurance providers at our service. Competitive rates are sought on renewal and we have been able to save thousands of pounds by shopping around for the most applicable and best value cover. As well as buildings and estate insurance we are able to advise and arrange on both Directors & Officers liability insurance and engineering policies which will help to protect the development against unplanned expenditure. Every development, block of apartments and estate is so very different. If you ask us to put together a proposal we would prefer to meet on site to discuss your development and requirements in detail. We offer a bespoke service at a competitive rate with as much or as little day-to-day management control as decided by you. Above all, we offer an extremely flexible approach to management, from merely collecting the service charge through to our full management package. If you have any questions, why not get in touch.